In 1973, Prefontaine scheduled a race at Hayward Field to pass the hat to raise money for him to compete in Europe. “It was free. It was almost just a workout. It was, `Come and watch me and I’ll run a four-minute mile,’ ” Hollister said. But the wind shifted and brought smoke from nearby grass-field burns over the campus. Prefontaine ran the mile in 3:58 anyway. “You really almost had to drive with your headlights on the smoke was so thick,” Hollister said. “He showed up and ran a four-minute mile. It was a pretty gutty and impressive effort. In 1974, he was back, setting five American records and winning five races in Europe. He set his sights on the 1976 Olympics, when he would be 25 and just reaching his prime. His contemporaries say Prefontaine was far ahead of his time in the fight for athletes’ rights for endorsements and earning money to train. Tagged athletics subsidy, health center. Bookmark the permalink. 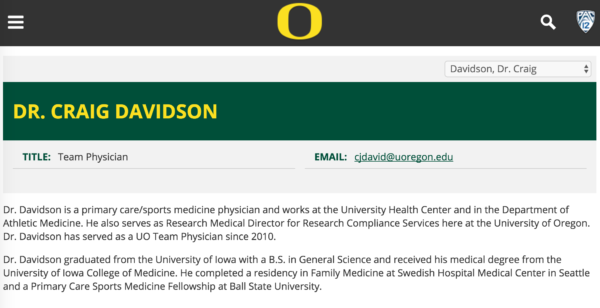 10 Responses to Why are UO students’ health fees paying for the Duck’s Team Doctor? 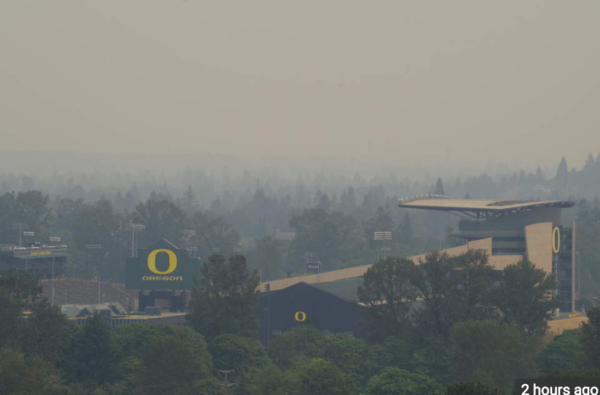 I live off of Cal Young, close to Coburg Road, and the miraculous draughts of wind that cleared Autzen Stadium yesterday (that RG article was ‘updated’ “shortly before the Oregon Ducks kicked off”) didn’t reach my backyard. But of course the divine Providence looks with particular care inter alii upon the Ducks. An interesting source of pressure is the pressure that team physicians often place on themselves. There are 2 reasons, according to Polsky.11 First, team physicians routinely believe that they are part of the team and therefore sacrifice a player’s health for the sake of the team. Second, a team physician may put undue pressure on himself to please management so he or she can keep one’s position because of the many benefits received from the status as a professional sports team doctor. The strong pressure creating conflicts of interest for the team physician may cause one to compromise one’s medical judgment. Your linked NYT op-ed doesn’t argue against regular re-certification, only the antiquated way in which some re-certification is done. And Letting your certification lapse for eight years seems more lazy and professionally irresponsible than anything else. And that goes double for the AD for letting him get away with it. Maybe there should be a followup asking what kind of continuing ed/professional development he spent the last eight years doing. Here’s the relevant excerpt: “Two recent studies in The Journal of the American Medical Association are the first to seriously evaluate the role of M.O.C. in physician quality and medical costs. They compared doctors certified just before the 1990 change (who were grandfathered in for life and not required to recertify) and their colleagues who certified just after 1990. One study looked at costs and the other at quality (as measured by patients’ glucose levels, blood pressure, colon cancer screening rates and the use of medication for heart disease). The studies differed in methodology but the upshot was that patients’ medical outcomes were no better and overall costs were only marginally lower in the recertifying group (2.5 percent). The rest of the piece goes on to say that some recertification is useful and makes suggestions for improvements. I understand now. 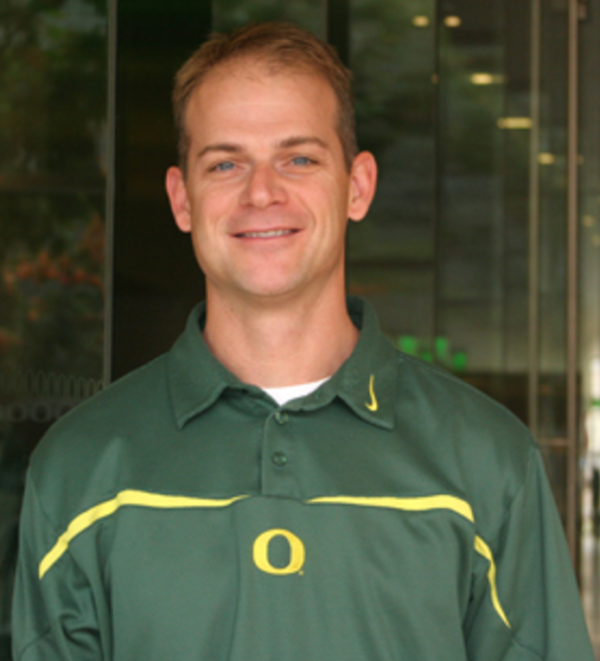 Once hired at the UO qualifications are no longer a requirement. This must be what is happening with the Administrators as well. Get in the door and then you can put your feet up. 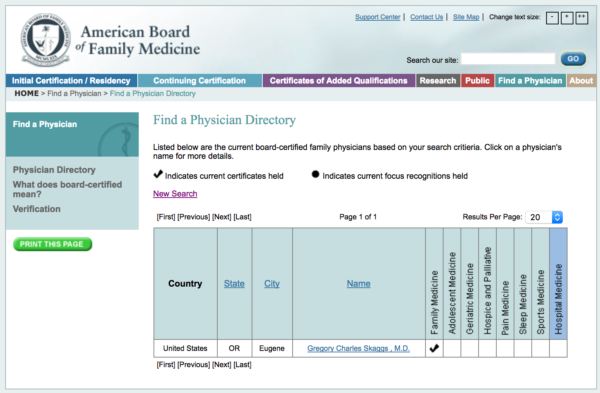 The NFL requires that *all* team physicians be board certified in Sports Medicine. Of course NFL players have a union to protect them, rather than an AD like Rob Mullens. tasks of all primary athletics health care providers.